Google is turning 15 years old and to celebrate, the birthday kid revealed a major search engine overhaul plus a revamped app for iOS users. You know, nothing major. We'll start with the whopper: Google has changed its underlying search engine algorithm, a re-do it actually introduced about a month ago. The last time we saw an update this big, Caffeine was being poured in 2010. The new version is codenamed Hummingbird, and it's designed to improve over 90% of our complex searches. "Hummingbird makes results more useful and relevant, especially when you ask Google long, complex questions," Roya Soleimani, a Google spokesperson, explained in an email. "[It] pays more attention to each word in the query, ensuring the whole query is taken into account." Even if you're not sure of what your trying to search for, Hummingbird will pump out results relevant to your search terms. If there are plenty of relevant matches to the terms, Google will now do a better job picking the strongest web result for you. On the app front, Google is spreading some good will to a competing platform, announcing that its iOS Search app will soon be updated with push notifications. You'll receive heads ups across platforms, so a reminder to buy milk set on your Nexus 7 will pop up on your iPhone 5S, for example. What's more, Google's familiar "OK Google" command prompt is also making it to iPhone and iPad owners. Don't be jealous, Siri. iOS users will also be able to dive into maps directly from the Search app. 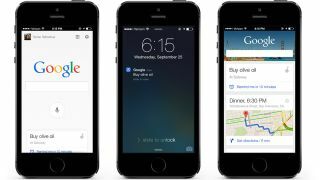 The whole idea is to make the Google iOS app as robust and self-contained as Google Now is on Android, though naturally the level of integration isn't same between the two. Android users aren't being left out of the fun, however. Google Now on Android will also get a bump-up in intelligence, one that will save you time and breath. The Verge caught a Google demo where it asked about the Eiffel Tower, and follow-up questions about its height and location without having to state a whole new question for every little factoid. It's all thanks to some Knowledge Graph bumps, which we'll touch on below. Google is also shuffling the UI for Search on mobile and tablet to include more cards. Google Now users should recognize the new card-based UI as it's been showing up across Google properties, but the update is more than a new coat of paint. With the new look comes improvements to the Knowledge Graph that should, like Hummingbird, give you the answer you're looking for with the least amount of effort. Want to compare the amount of saturated fat in butter and oil? A card with a complete, expandable comparison will appear. Search for a band, and a scrollable list of songs appears too. Click on a song, and the title's video will appear in results. Users should see these updates rolling out soon. Evernote is making some pretty big changes too, you know.